My camera is an old, Sony Cybershot 717. It’s seven years old and obsolete by today's camera standards. However, it still works great and I've taken many thousands of pictures with it. Although it's only 5 mega pixels, it has a quality lens and the ability to take macro shots as close as an inch away from the subject. When taking pictures for the web or for printing pictures 8x10 size or less, 5 mega pixels is perfectly adequate. My brother bought a re-conditioned, used camera like mine a few years ago on eBay and is pleased with the pictures it takes of his beadwork and quilts. In my experience, however, the real trick for quality images is more about photo editing than the camera. 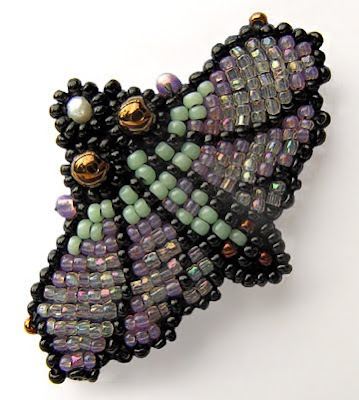 Learning how to use Photoshop was the best thing I ever did for myself to improve pictures of my beads and beadwork. 1. 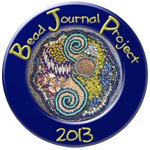 Beads are shiny objects, which reflect light, especially faceted beads. Therefore, almost all direct lighting yields terrible results. I take most of my pictures outside on days when there are high clouds and the sun is overcast. If I can’t wait for a day like that, I take pictures outside in the full shade and place a large white cardboard behind the item (out of the picture frame) and wear a white bib apron to capture and reflect ambient light. If it’s raining or snowing and I can’t wait for a better day, I take pictures inside near a south-facing window (with all the lights in the room turned off) around noon or when there is the most light in the sky. I own three professional lights and a light tent. However, I rarely use these. Natural light on an overcast day gives better results with truer color. 2. Camera shake is responsible for many out-of-focus pictures of beading. The closer the camera is to your subject, the more you’ll see the effects of camera shake. I always try to brace my elbows on something and hold my camera with both hands. When I really care about the picture, I get out the tripod and take the picture with a remote control cord. 3. Another common reason for pictures being out-of-focus is using automatic focus with an incorrect camera setting. For my camera, if I am less than 3 feet from my subject, I must select the macro setting if I want my subject to be in focus. 4. One more reason for out of focus pictures has to do with depth of field. Flat beaded objects aren’t a problem. But if you are photographing a cuff or a sculptural item, you’ll want as much of the subject as possible to be in focus. The closer the camera lens is to the object, the less depth of field you will have. Therefore, don’t get too close. The more depth of field you need, the father away from the subject you need to be, even if there is a lot of extra space around the subject as seen through your viewfinder. When editing your image, you can crop the background away. 5. Distortion is another problem you will sometimes have when the lens is too close to the object. Again, it helps to move farther from the subject. Later, you can crop the picture to show just your subject. I use Photoshop CS and occasionally Photoshop CS2. I do not have experience with other photo editing programs. I’ve heard that the less-expensive Photoshop Elements offers many good features, but I haven’t seen or used it yet. Whatever photo editing program you use, there are certain things that can greatly improve the quality of your digital photos. For example, below is the original photo I took of the moth pin (posted here). Not a very pretty picture, is it? Below that is the same photo after I edited it with Photohop CS. To learn Photoshop, I took a 20-hour class at our local community college. That was a good start, but I needed more. Scott Kelby has written several excellent books that provide everything else I need to know. The Photoshop Book For Digital Photographers is my favorite of his books. The following are the Photoshop editing features that I find most important and use most often. Although I'm not explaining in detail how to use these features here, the list will give you an idea of what features are important to have and to learn in the photo editing process. 1. Levels. The first thing I do with each image is adjust RGB (red green blue) levels. Most photo editing programs offer an “auto level” adjustment feature, but generally it’s not as accurate as doing the adjustment for each range of the spectrum individually. 2. Shadow/Highlight. My second adjustment is one that brings out the details in the shadows and the highlights. This adjustment will make the picture look a little flat. But you will be able to see detail in all areas of the picture. For example, in the moth pin original picture (above), you can barely see detail in the lower body of the moth. In the adjusted picture, all of the detail is seen. 3. Brightness-contrast. Next I adjust the brightness level. If I have previously adjusted shadow-highlight, then it’s often necessary to increase the contrast a little. 4. If I’ve taken a picture of a square or rectangular object, I check for distortion. This can be corrected using the transform adjustment, which allows me to compress or extend the image at each of the corners. 5. Rotate and crop. I rotate the picture as needed so that the subject is in the desired position. I crop the edges of the picture to showcase my subject with only a small amount of background. 6. Many times, my pictures have a blue cast to them, especially if I’ve shot them in low light conditions. There are several different ways to correct color. The easiest way to correct a cool color cast is to apply a warming photo filter. Red is a color that may look too garish in digital photos, especially if the contrast is high. To correct an over-intense color, I use the Hue/Saturation adjustment, selecting the offending color range and lowering the saturation level. 7. It’s useful to know how to burn (darken) and dodge (lighten) specific areas or tones in your picture. For example, if you need better contrast in a certain area of your picture, you could burn the shadows and dodge the highlights in just that area. 8. On important pictures, like the ones for my books, I often remove the entire background. For this you need to know how to paint the background white or erase it altogether. I’ve never found a quick or easy way to do this. I enlarge the picture to 400% and work in very small areas so that I don’t accidentally erase or paint over details on the edge of my subject. 9. Rubber stamping is a good feature to learn. It allows you to copy any size area and paste it somewhere else. 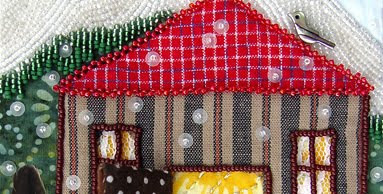 I use it to fix backgrounds and occasionally to place a copied bead over a bare thread, where my bead spacing wasn’t quite right. These areas are more noticeable in a digital picture than they are on the real piece. 10. Save as. After all the above adjustments, but before sizing and sharpening, I save the picture as a tiff (.tif) in a folder called Adjusted Pictures. Later if I want the image a different size or perhaps sized for printing, I work from this version. After saving, I continue to edit the image for my blog or other web application using the steps below. 11. Sizing. It’s very important to learn how to size your images, with appropriate dimensions and resolution for your intended use. If a picture is for my blog and I want it sized for maximum click-to-enlarge, I generally set the resolution to 72 pixels per inch. I set the width to no greater than 12 inches and the height no greater than 9 inches. If a picture is for my blog but not one where the enlarge feature is important, I set the width and height to under 5 inches. I posted specifically about sizing pictures so they will click to enlarge here. 13. When I’m finished with all the above adjustments, I save the image again, this time as a jpeg (.jpg) in a sub-folder within my main Blog Pictures folder. 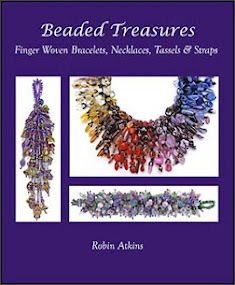 It's wonderful to feel good about the pictures I post here or on my website or Flickr, to feel that they adequately represent the quality, colors and attractiveness of my beading! Learning to do this has involved a lot of trial and error... it wasn't easy for me. But, it certainly is worthwhile! Hope this post will help some of you! Photographing beadwork is not easy. Personally, I think I need a wide angle lens! To Morwyn and LB ~ Both of you present fabulous pictures on your blog and other web sites!!!! Wide angle lens? Hmmmmm... You may have a point there, LB! Wow, what a treasure trove of information! I will return to this post as I edit my photos, and hopefully learn enough to improve them. Thank you! THANK YOU soooo much, Robin! You've really given me a shove in the derriere to actually *use* Photoshop instead of take a couple courses and then forget about it. Since I work on a Mac, I always use the editing program in iPhoto. Lazy, I know. I could do so much more if I'd just practice with PShop. Your tips are so straightforward, it takes much of the "how to" mystery out of it, especially about how you Save and file the finished images into folders. Thanks again for providing these valuable tips! Great info and thanks for this topic. I don't know how well they compare with Photoshop, but for the cost conscious, there are some free photo editing websites such as www.splashup.com where one could play around. Perfect timing Robin. As a newbie and having my first piece ready to go I was wondering about ways to take the best shots. Thank you yet again for all you help and encouragement. Terrific info, Robin. Gives us all food for thought. Excellent advice, Robin! I learned quite a bit from this. I'm really glad to find that I'm not the only one who still uses CS1. A Photoshop tool I particularly like is Curves, which I use just after Shadow/Highlights. It seems to help add more dimensionality to the shot. I haven't had much luck with Levels, but you've inspired me to try it again. To Lois ~ I'm just the opposite... I've tried Curves, but don't feel I have as much control as with Levels. However, the experts are on "your side!" To Vicki ~ Thanks for mentioning the free photo editing on-line sites. They are certainly worth a try! When I put a photo into photoshop, I always first make a duplicate photo to work on. That way I still have the original as a back stop. I'm not a beader(yet) but I have to tell you how much I like your work. I spent some time looking at your pictures on Flickr and they were so cool. I think your a great storyteller. Great post Robin, thanks for all the wonderful information on photoshop, I do need to learn more about this program, just get frustrated with the book I have, thanks for the great resource, I'll look for that as well. Thanks so much for taking the time to post this! I'm working on improving the photos on my blog, and you've inspired me to think I can do it with my current camera. Thanks for the great tips, Robin. I, too, have an old Sony Cybershot and was thinking maybe I need a new camera. Now I can use that money for more beads. :) And will continue to learn more tricks with PS. Thank you for posting , this is totally helpful! Great tips, Robin! I need to take some submission photos this coming week so I will definitely be referring to this post. Thank you for sharing this excellent information! Wow, thanks so much for sharing all of this! I'll be linking. Thanks a lot for sharing these tips. I also have Photoshop CS. I use PS Elements at work and haven't seen a whole lot of difference, at least on the photo adjustment parts. It may not automate actions in the same way. For new PS users - all the different versions are pretty much the same for the new user - changes tend to be made in the upper levels of the program - so if you can find an older version used or inexpensive, start out with the least expensive version you can. To Pegnard ~ Thanks so much for mentioning about the older versions of Photoshop. The one thing I LOVE about PhotoshopCS that isn't in the earlier versions is the Shadow/Highlight feature. CS is about three versions down from the most current version, so it's probably out there for a pretty decent price. However, I don't think I'd want to go back to Photoshop 5 or 7 at this point. To Connie ~ Come on! Pick up some beads and let's go!!! Thanks for your compliment about my story telling... That's a new one for me! To Vickie and Statch ~ Yea!!!! 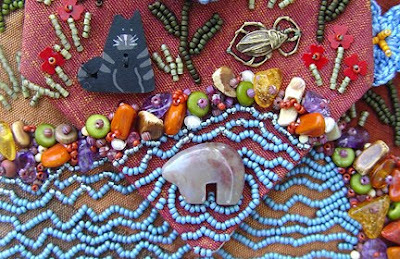 More beads and more photo editing! Excellent article Robin. Like you i also have an old camera, a 9yo Nikon, and I always edit my photos but i learnt a lot from your article. Thankyou, i'm going to bookmark it. K.
Wow, this was a great post. Lots of good information for people to use while editing photos. I saw a couple people commented about submissions for shows/magazines. Most of them want a clear focused (important word here) that has a resolution of 300 dpi with a size of at least 3 inches by 5 inches. 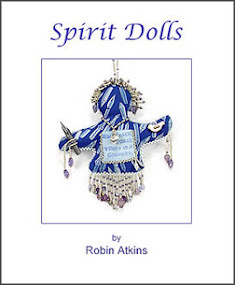 I submit to doll magazines & that is usually what they want, but always make sure to check the article/rules before sending any image to an editor. Maybe you could get a copy to review, but at the very least, it might help guide your collage process for the year. Hi Robin, thanks for the great tips and pointers. 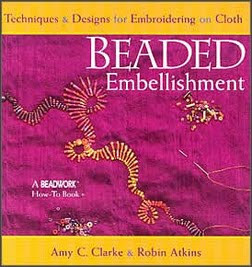 Most of my work is silk embroidery although I have been bitten by the bead bug also. Outside on a lightly overcast day is my preferred conditions for photographing both. When I needed to get some pictures taken on an extremely bright afternoon. I stretched a thin, whiten cotton sheet overhead, that softened the light nicely. I don't do much photo editing but I will use your pointers to investigate it some. I've never thought about editing the photo to disguise some of the things that macro photography highlights. Its an impressive beads work. Thanks for sharing with us. I have been using ps7 for a long time, but I decided to treat myself, and ordered a copy of cs3, I should get it later this week. Anyone know if there are major differences? To Pam ~ I started with PS5, then got PS7, then CS and then CS2. 5, 7 and CS all operate with great similarity. With CS2, Adobe changed the browser to a separate program. So you have to open both programs. There are some batching advantages to CS2 plus the feature I use most with CS2 is the lens correction for barrel distortion, which works like a charm. Other than for those two features, I prefer to use CS because of familiarity with the browser functions. I know nothing about the changes in CS3. CS is enough for me... I'll never know the whole thing and between CS and CS2, I can't imagine needing anything else. I shall look forward to reading any other responses we get about CS3. SO glad you wrote this post Robin. What a mensch you are! So informative as always Robin. Great article, thanks Robin. I'd like to suggest that you include it as a page on your website, in your "tips" area. This info is worth saving in a way that will be easily found in the future. Well, everything in your blog fits that description, but you know what I mean! 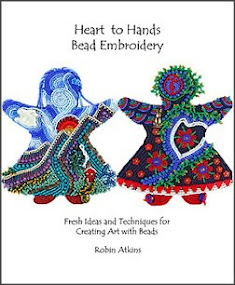 Beautiful photos and beautiful beadwork! I have Photoshop but tend to use an older more basic program for erasing backgrounds etc as Photoshop confuses me!! Wonderful tips! Taking good pictures is almost as hard to master as the beading itself. Thank you for sharing your experience! 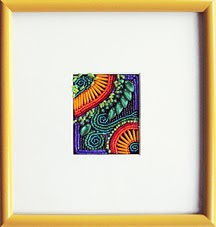 :) Your beaded items look amazing! Thnak you for needed information that will transfer to my area oif interest, Fossil Fish. Well, when tax refund comes, photoshop won't be far behind. 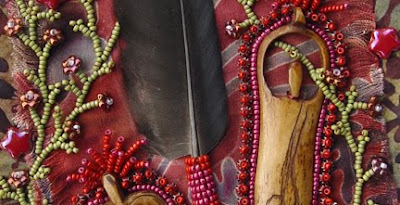 I absolutely understand the distortion factor as it comes to photographing my beaded gourds. The photos never do them justice. I don't have the facility for taking a photo class but I follow directions real well and may have to do an online sort of class. Thank you Robin! 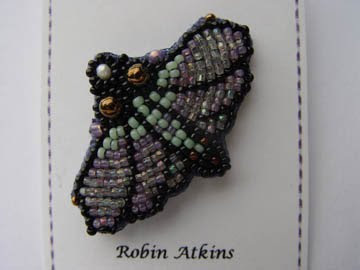 I continue to learn and grow through my dabbling with beads .... and to think I began as a newbie with the first BJP. Thank you for sharing your knowledge, for being so reassuring and confident, for paying attention to so many of us out in bead-land. Meanwhile I continue to dabble and play (& totally drool over other BJPers art!!! including yours!!!). Thank you for taking the time to sum up all this. I am trying to figure out how to use photobucket images in blog posts that will enlarge, and whilst "googling" I landed on your blog!! Firstly, wow!!! 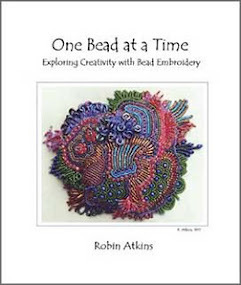 Your beading is amazing!!! I've traveled through the last few months and what I've seen is spectacular, the beading and the photography!! Secondly, this post is very informative, thanks for the pointers!! I can only hope to get photos as gorgeous as the ones you've shown, practice practive practice!!! It's been a pleasure!! What a nice blogg. i am following you here from sweden. Keep up the good work.! As all the other people say!!! nice post keep up tje good work. nice post. I like your work and appreciate you for your good job. 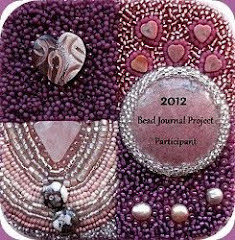 Bead Journal Project for January ~ Fini! 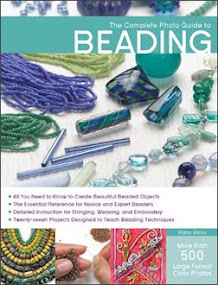 Beading with World Beads ~ Giveaway!